One of the ten lepers that was healed, runs to Jesus and falls down before him, worshiping him and thanking him for the miracle he had performed. NE DAY JESUS and his twelve disciples left Capernaum and took the south road leading through the country of Samaria. They were going to Jerusalem. On their way they came to a certain village in Samaria where Jesus wished to spend the night. So he sent messengers to find a place for him and for his disciples to rest. But the Samaritans in the village would not permit Jesus and his disciples to stop with them. They would not allow them to rest in their village. They knew Jesus and his disciples were Jews, and the Jews had often been unkind to their people. Now they, too, would be unkind. Two of the disciples, James and his brother John, were very much annoyed by the unfriendly actions of these village folk. They felt that their master had been mistreated, and they wished to see the villagers punished. They remembered how Elijah, the prophet, had once called fire down from heaven to destroy some wicked people, and now they came to Jesus and asked, "Will you permit us to call fire down from heaven to destroy these unkind people who have turned us away?" But Jesus answered, "Your desire is not good, for the Son of man is not come to destroy men's lives, but to save them." Then he went with his disciples to another village. And as they went a man came to Jesus and said, "Lord, I too would follow you wherever you go." No doubt he believed as did the disciples, that Jesus would soon be the great king of the Jews for whom so many were looking, and he desired to be a friend of such a great person. But Jesus answered, "Foxes have holes in the ground for their homes, and birds of the air have nests; but the Son of man is so poor that he has not even a place of his own to lay his head." Ten men who were lepers saw Jesus and his disciples passing by. These men had heard about Jesus how he healed other lepers, and now they called loudly to him, for they stood far off. They cried out, "Jesus, master, have mercy on us!" And Jesus heard their cries. Never did Jesus pass by and refuse to help one who called earnestly to him. And now he stopped and called back to the lepers, telling them to go and show themselves to the priests, as Moses had commanded every leper to do who was healed. They understood what Jesus meant, and they started at once to go to the priests for an examinations. And as they went the leprosy left their bodies and they were made every bit well. One of these lepers stopped and turned back just as soon as he saw that his leprosy had gone from him. 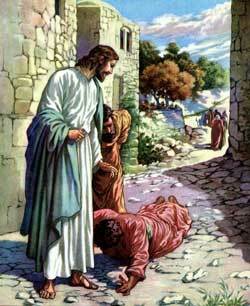 He ran to Jesus and fell down before him, worshiping him and thanking him for the miracle he had perform. And this man was not a Jew, but a Samaritan. The other men, however, hurried on their way, never stopping to thank the great healer. And Jesus said to the disciples, "Were there not ten lepers who were made well? But where are the nine? There is none turned back to give thanks except this stranger who is a Samaritan." Then he said to the man kneeling at his feet, "Rise up and go your way, for your faith has made you well."